We really love the entire process Eden uses for their canned beans and think they are the best brand available for canned beans. These USA small farm organically grown Cannellini Beans are soaked overnight and expertly cooked at Eden's certified organic and circle k kosher cannery. 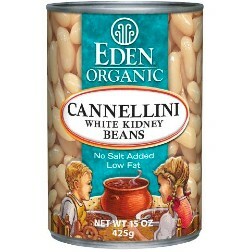 Cannellini is a large white bean, also known as White Kidney. A staple in the Mediterranean diet, creamy and sweet. Very high in thiamin (vitamin B1), rich in dietary fiber and a good source of protein, iron, magnesium, and zinc. Low fat, low sodium with no salt added. Packed in bisphenol-A free cans. They are packed in bisphenol-A free cans, which is a huge plus and a necessity to protect the quality of canned foods. Make sure to rinse your beans thoroughly before using them.